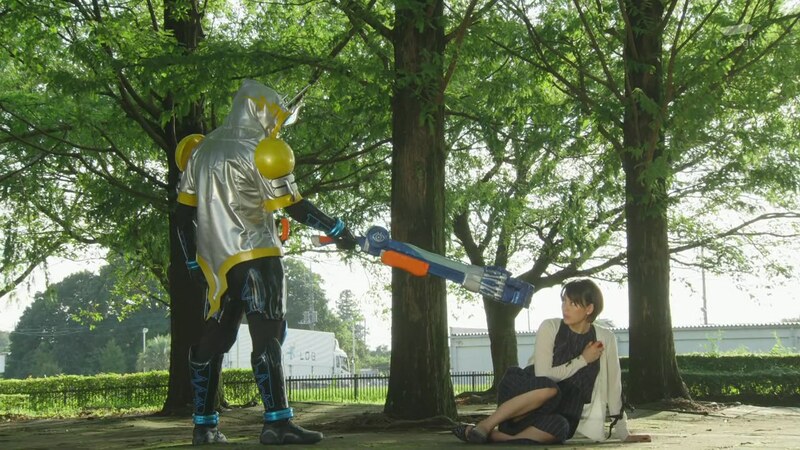 Recap: Kamen Rider Ghost, Episode 6 – Destiny! The Comeback of Melody! 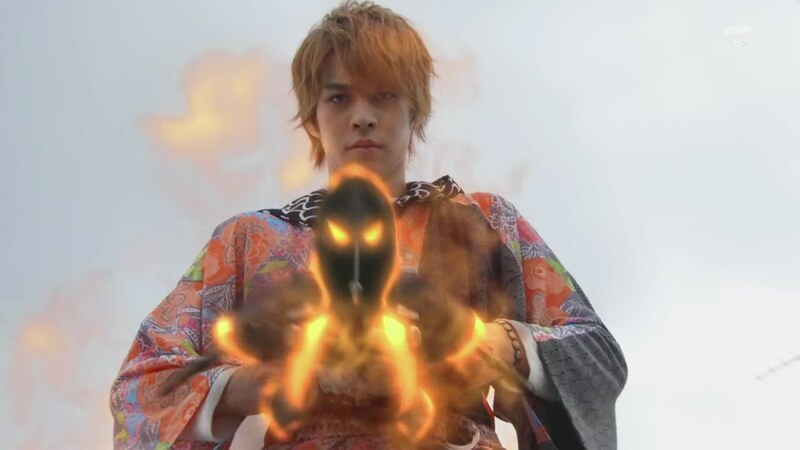 Grampa Sennin clues Takeru into Beethoven being the next Eyecon-d luminary. 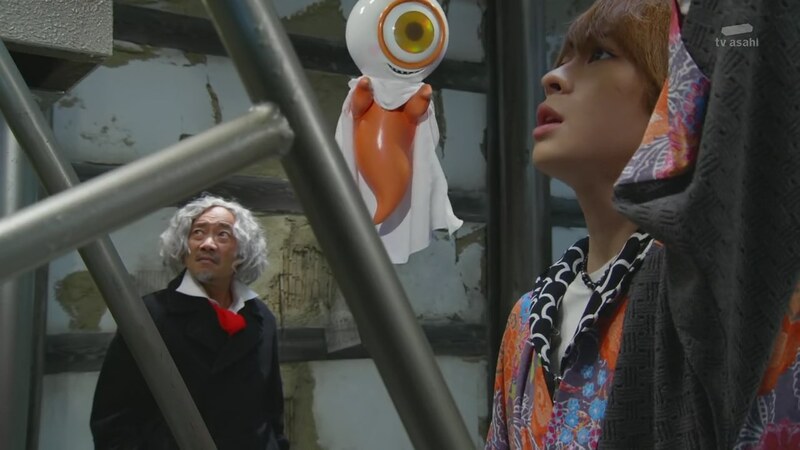 Takeru takes note in his Eyecon Get! Schedule Journal which he worked hard on to get serious about collecting them. Grampa Sennin and Yurusen say it’s pointless and Gramps tosses it in the trash. Akari comes down to the lab to say they’ve got another case. But she doesn’t immediately see him. 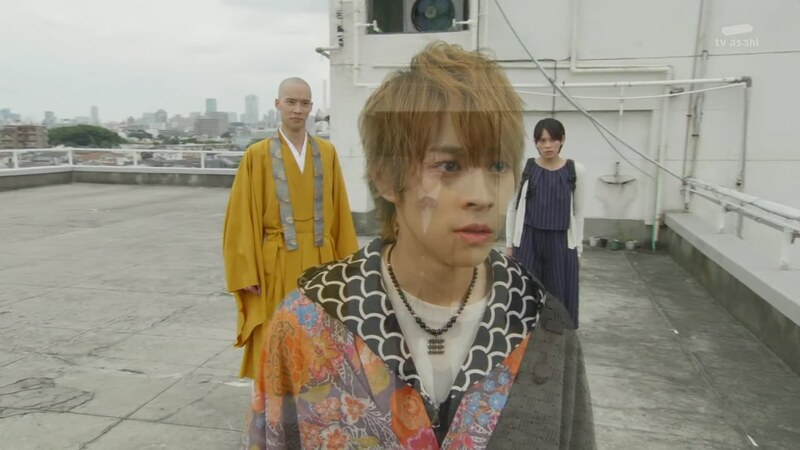 Yurusen says Takeru wasn’t channeling his emotions to allow to be seen. Akari gets her Shiranui and thinks Takeru was just messing around. But Takeru immediately disappears again while Grampa Sennin stays visible. He says Takeru is in a slump. He can’t show himself if he’s feeling anxiety or fear. And if he stays like this, no one will ever see him again. Takeru takes the slip of paper from Akari with the case and rushes out. Takeru and Akari head to Seika Music College. Onari has been talking to their client, Kimijima Youko. Suddenly, the sound goes out around them. Takeru sees a Ganma. Youko explains that this strange phenomenon has been happening around her brother Kosuke who is an internationally acclaimed composer. But recently, he’s been in a slump. Aha! Takeru’s excitement makes him visible as he remembers Beethoven being able to write famous pieces of music even with a loss of hearing. He grabs Youko’s hand and asks her to take him to her brother. The Ganma watches them from above. They get to Kosuke who is busy composing and yells at his sister to shut up. The trio tries explaining the situation to him, but he says if he can’t compose then he is not truly alive. There would be no meaning to his life. 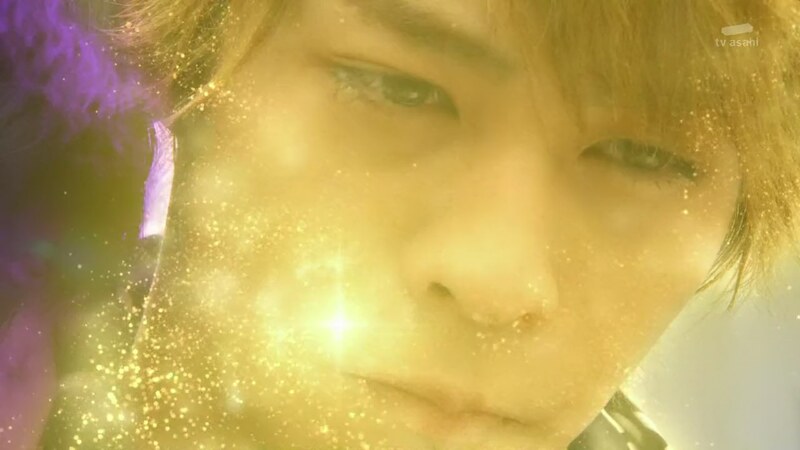 The words affect Takeru and he goes invisible. Akari tries to get through to Kosuke, but the sounds once again go silent. Except for Kosuke’s piano. Akari shoots her Shiranui and reveals both the Ganma and Takeru who henshins. Takeru and the Ganma take their fight outside, still with no sounds until the Ganma unleashes a big attack on him. Takeru tries to finish this quick, but Makoto arrives. 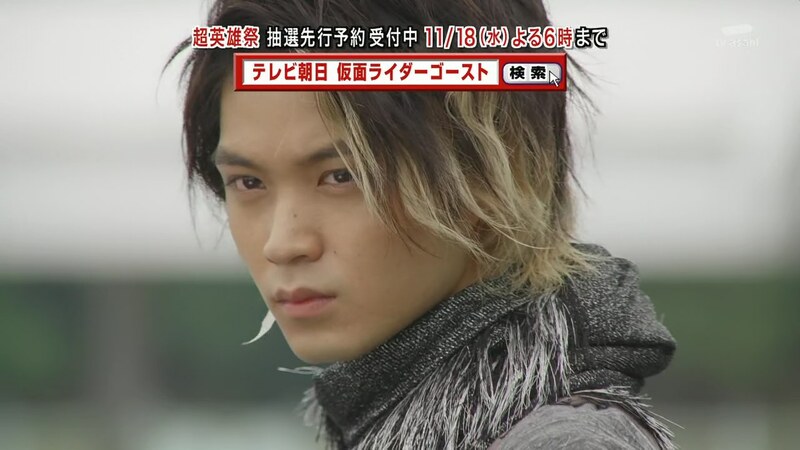 He henshins and fights Takeru. 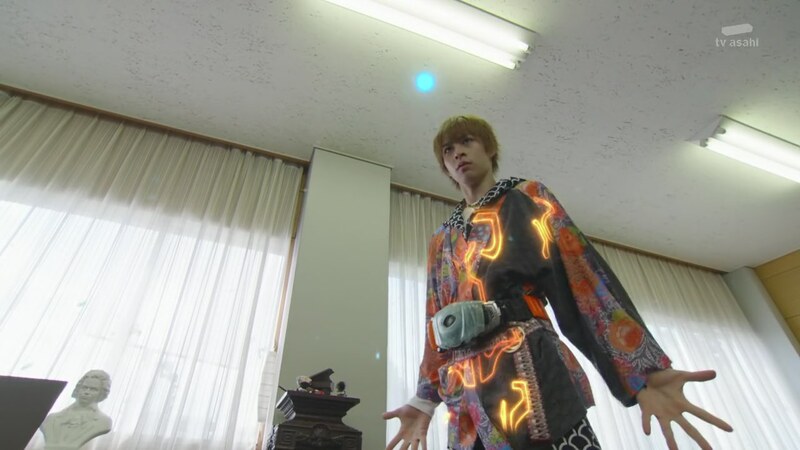 He goes Edison and forces Takeru to dehenshin. Takeru pleads with him to stay away. 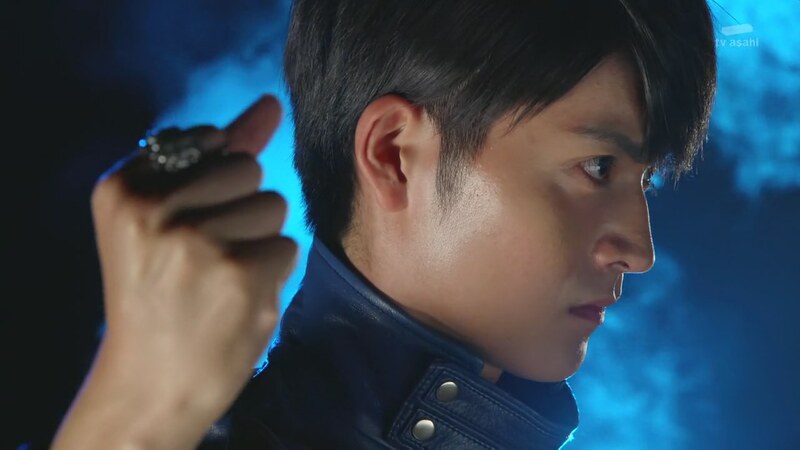 He tries grabbing his Eyecon, but Makoto shoots at his hand. Takeru goes invisible and stumbles away. Makoto reaches for the Eyecon, but Akari swoops in and grabs it. Makoto demands she hand it over and points his gun at her. Akari doesn’t flinch, holding her ground. Makoto suddenly pulls back and says he’ll let her go just today. He walks away. 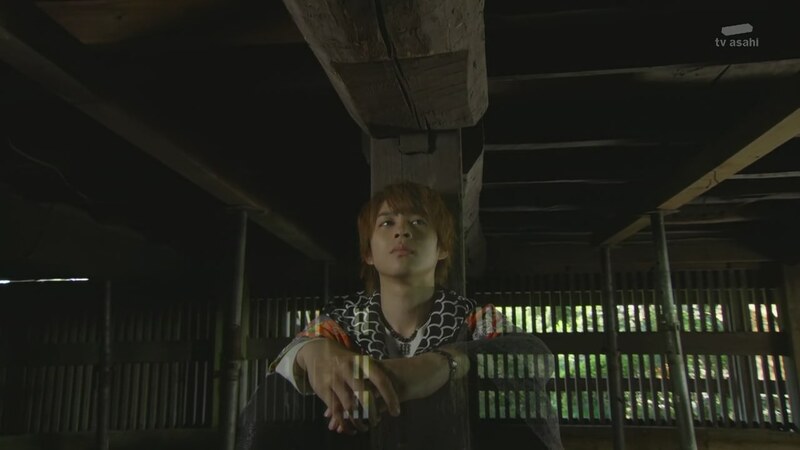 Takeru is crouched behind a nearby tree, but leaves when Akari calls for him. Back at the music room, Kosuke finishes his composition. He goes over to some of Beethoven’s original sheet music he has and is excited about becoming as legendary as he was. The Ganma influences him by saying he won’t truly become legendary until he dies. Kosuke runs out. 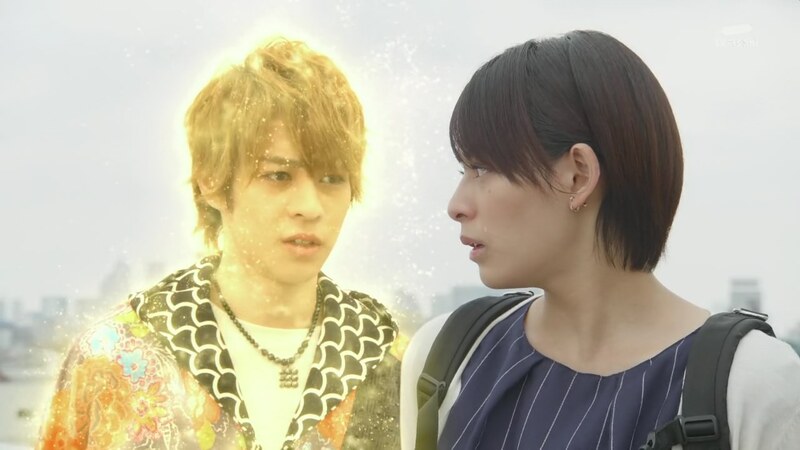 Makoto is by the water and his little sister talks to him… from an Eyecon! She says she knows he’s thinking about how he and Akari used to be friends. Aran approaches and asks if he’s helping out this time. 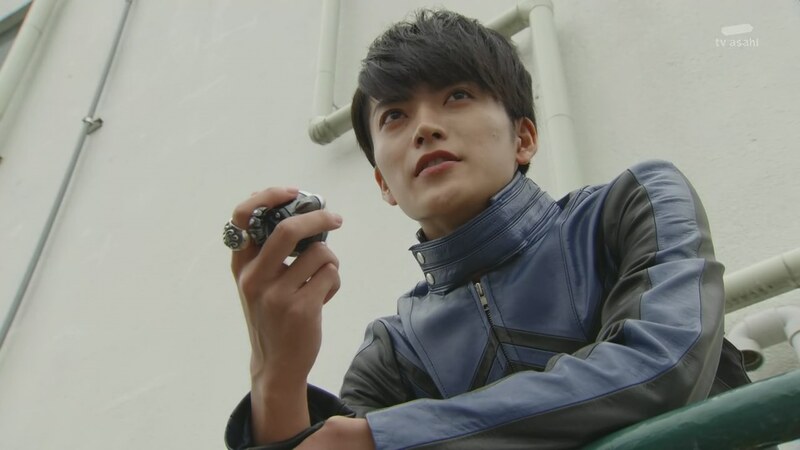 Makoto tosses him an Eyecon to borrow. Aran says this only makes him more unsure what Makoto’s true goals are. 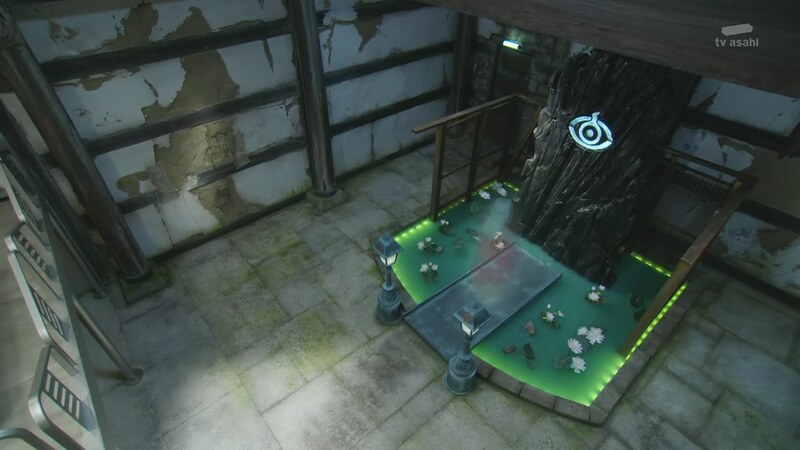 Back at the temple, Takeru still hasn’t shown himself. Onari and Akari talk to Youko. She says her brother used to be so kind. That is, until a/the Mysterious Man gave him Beethoven’s sheet music and some other supplies. Onari tries to comfort Youko who says all she wants to have her brother back to his old self. Akari think she knows where Takeru might be. She goes to his favorite place under the temple where he would go as a kid whenever he was scared or in trouble. Takeru is indeed here, but Akari is still not sure since she can’t see him. Either way, she lets out her feelings. All these things that have happened so far have been overwhelming for her. But it’s alright as long as Takeru is still here. She knows he’s the one that has it rough right now and she doesn’t know what she can do to help. 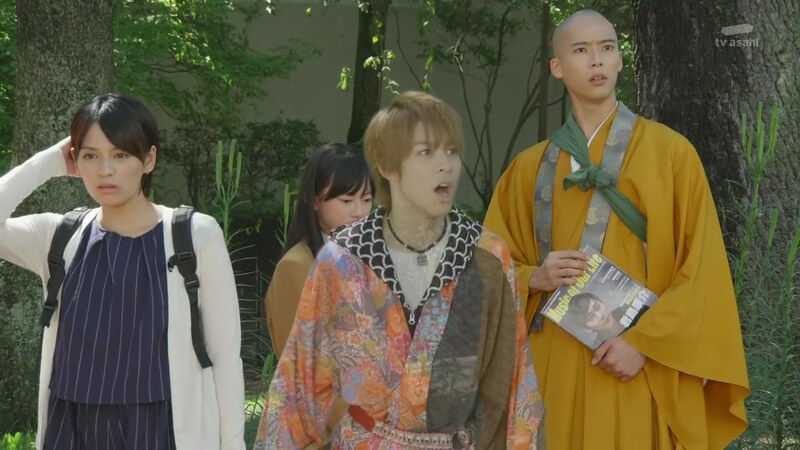 Onari receives a package from the mailman who tells him about someone threatening to jump from a building nearby while holding sheet music. Youko knows it is her brother! They get the mailman to bring them to the site. Onari, Akari and Youko head to the rooftop. Kosuke says people only become legends once they die. Onari asserts that one leaves their mark in history through hard work and dedication. Takeru, still invisible, says Beethoven too considered suicide once he lost his hearing. But he didn’t give in to his sorrow and give up. That’s why he was able to create more masterpieces. Akari asks if Kosuke really wants to be remembered in history so badly. Kosuke replies that there’s no point in only living. You might as well be dead. Don’t say that! Youko says, “you are my only brother!” She falls to her knees in tears. Makoto watches from a nearby roof. Kosuke gets off the ledge. Maybe also believing in himself. Youko runs over to hug her oniichan. But the Ganma again whispers sweet nothings. Youko tries to stop her brother from jumping off the building. Takeru hugs them both. A tear falls and the Ganma’s hold is broken. The sheet music glows. Makoto is about to eyedraw, but stops himself. Takeru henshins. Takeru draws the eye over the sheet music and Beethoven pops out. Akari shoots the Shiranui and the Ganma becomes visible. Takeru goes Beethoven and none of the Ganma’s horrible music can match the beautiful music from the luminary. Akari tosses Takeru the Musashi Eyecon she grabbed earlier and Takeru switches over. He quickly takes care of the Ganma. Makoto’s sister is happy everything worked out. He says he’ll let Takeru enjoy victory. For now. 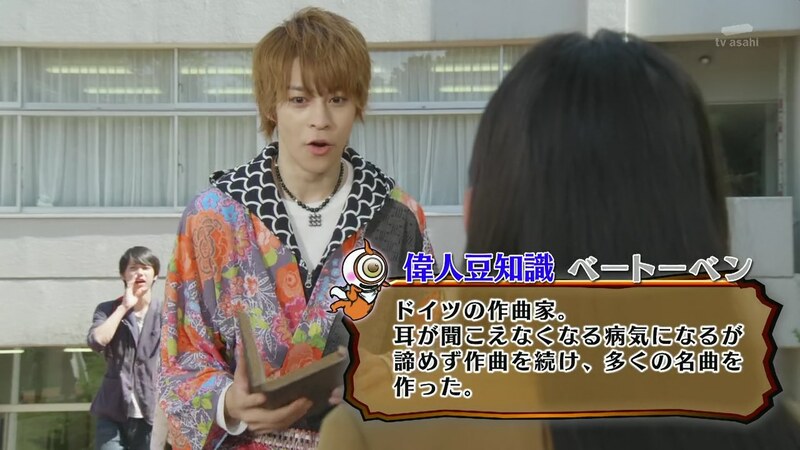 Back at the temple, Onari shows Takeru a thank you letter from Youko who says she is enjoying learning music with her brother. Takeru asks Akari about what she said under the temple. But she says she’ll be able to explain everything with science soon enough. It was her, after all, who developed the Shiranui. Grampa Sennin talks to the Monolith in the lab and says it’s time to start the next step. Oooo! Lots of stuff this episode. First to the case of the week. Very interesting story. It was a very creative story which really did well in weaving together Beethoven’s history with a monster’s power and the civilian target’s story. Suicide, posthumous recognition, hearing loss and the meaning of life! All in one episode. Amazing! The silent stuff was very amusing though. It sounded like someone dubbed over the actual episode with gibberish. Lol It was fun. Then there’s Grampa Sennin and that Monolith which is even more mysterious than the Mysterious Man! About Gramps, I kind wish they don’t keep doing the thing where he basically tells Takeru what hero/luminary/legend he’s looking for this week. It’s too formulaic. Maybe have Takeru just figure it out on his own while they’re on cases. Like this episode, he would’ve known the parallels to Beethoven even if Grampa Sennin didn’t tell him earlier. He’s read that book of legendary peoples hundreds of time since he was a kid so he’s basically memorized all the info. Haha, anyway. Another great episode. And very nice development for all the characters. Yup we’re chugging along nicely. So, I guess Makoto’s motive is to revive his dead sister. 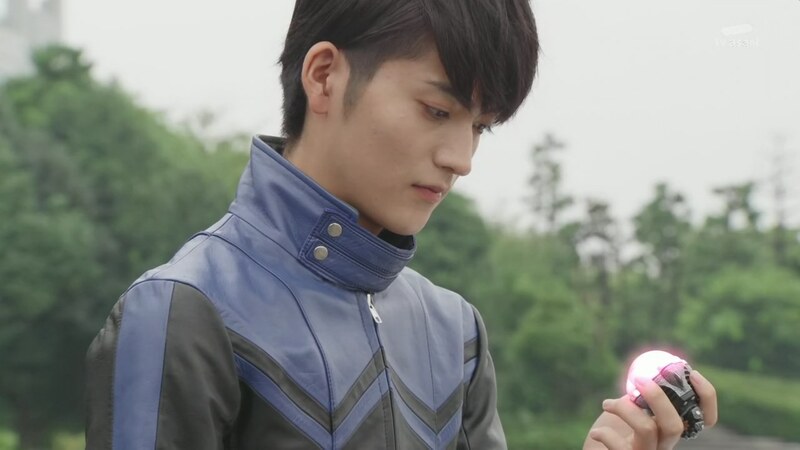 And he is definitely giving that Kaito vibe with that reveal that he actually knows Akari when they were kids. 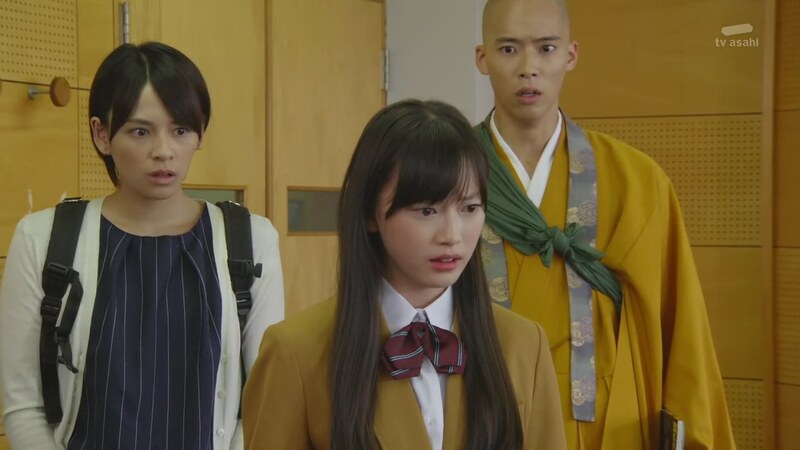 As for Akari, she is definitely starting to become more than just the sidekick/partner (definitely better than how Kiriko turned out to be, tee-hee-hee!). I guess Gramps telling Takeru who the particular luminaries/hero to go look for might be part of whatever plan he has. There is just a lot of hints that he is actually onto something. And then, there is the big question of what he actually is. Im guessing he is the same as that mystery man and Alan. Yeah, there’s definitely a lot of things to guess and speculate on. Makes it more exciting.